� Author(s) 2011. This work is distributed under the Creative Commons XXXXXXX XXXX License. Acid soils limit crop yields around the world due to nutrient deficiencies and mineral toxicities. Non-adapted plants grown on acid soils typically have smaller root systems because high concentrations of soluble aluminium (Al3+) inhibit root elongation. This restricts their ability to acquire water and nutrients. Plants vary widely in their capacity to tolerate acid soils and even genotypes within species show significant variation. The physiology and genetics controlling this variability have been studied for many years. The analysis of segregating populations and mutants has helped identify the mechanisms and genes controlling aluminium resistance in many species including wheat, rice, Arabidopsis, barley and sorghum. The release of organic anions from roots is an important mechanism of resistance in a wide variety of species. This trait is controlled by genes from two distinct gene families that encode transport proteins. 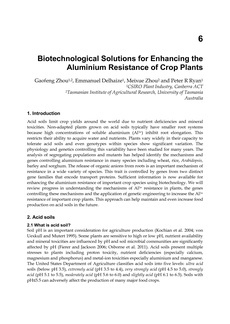 Sufficient information is now available for enhancing the aluminium resistance of important crop species using biotechnology. We will review progress in understanding the mechanisms of Al3+ resistance in plants, the genes controlling these mechanisms and the application of genetic engineering to increase the Al3+ resistance of important crop plants. This approach can help maintain and even increase food production on acid soils in the future.